By Chris Williams: While there countless guys that would be perfect opponents WBO welterweight champion Manny Pacquiao to fight, his promoter Bob Arum is eying a future match-up with former WBA World lightweight champion Brandon Rios in 2013. Arum sees that as a future big fight. Arum, by the way, just happens to be the promoter for Rios, so this would be one of those in house Top Rank fights that Arum likes to put together. Gosh, that’s like seeing Pacquiao fight Ricky Hatton again. What a joke. I don’t know that I like this mismatch. Rios looked pretty awful in his last fight against John Murray from the UK last month on the Miguel Cotto vs. Antonio Margarito card at Madison Square Garden on December 3rd. Rios had to starve himself for the last week before the fight to try and make weight and yet he still came in over the 135 pound lightweight limit and subsequently lost his title. 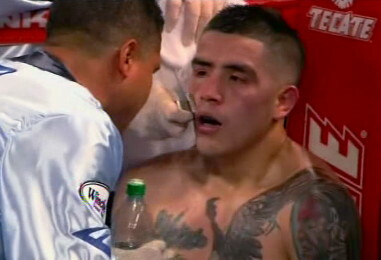 As for the fight, Rios was hit a lot and the fight was pretty close until the second half of the fight. I think Rios was perfect where he was at in the lightweight division but now that they’re talking about moving him up in weight to 140 to compete at light welterweight, I can’t see Rios beating anyone other than the WBC champion 35-year-old Erik Morales. Lamont Peterson would be too strong for Rios and Amir Khan would be much too quick for a plodder like Rios. He would take him apart. I think a Pacquiao-Rios fight would be like resurrecting Ricky Hatton and throwing him out there with Pacquiao to tee off on. Rios is like a poor man’s version of Hatton. He doesn’t do anything better than Hatton and would be a sitting duck for a fighter like Pacquiao with his speed and southpaw stance. Pacquiao eats up stationary fighters like Rios for dinner. I think Rios’ days as a champion are finished now that he’s moving up out of the lightweight division. He’s no light welterweight and to throw him out there with a welterweight like Pacquiao for an in house Top Rank fight, that’s an utter joke. I just hope that when the time comes for Arum to set up this mismatch, he at least gives the boxing public a good deal by discounting it to the hilt and selling it for $1.99 because that’s all I see this fight being worth. Rios is a plooder, a poor man’s Ricky Hatton in my view. « Will Pacquiao continue his slide downhill in 2012 or can Arum save him with careful matchmaking?